Place the water into your largest cooking pot or bucket/plastic bin and add all the turkey ingredients, stirring to dissolve the salt, sugar, syrup and honey. (Squeeze the juice of the orange quarters into the brine before you chuck in the pieces). Untie and remove any string or trussing attached to the turkey, shake it free and add it to the liquid. Add more water if the turkey is not completely submerged. Keep the mixture in a cold place, even outside overnight or for up 1 or 2 days before you cook it, remembering to take it out of its liquid (and wiping it dry with kitchen-towel) a good 40 or 50 minutes before it has to go into the oven. 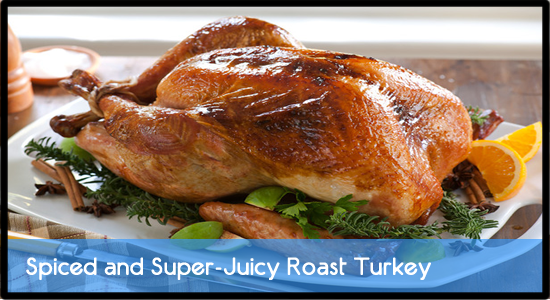 Turkeys – indeed this is the case for all meat – should be at room temperature before being put in the preheated oven. If you’re at all concerned – the cold water in the brine will really chill this bird – then just cook the turkey for longer than its actual weight requires. Cook the turkey for 30 minutes at this relatively high temperature, then turn the oven down to 350 degrees F and continue cooking, turning the oven back up to 425 degrees F for the final15 minutes or so if you want to give a browning boost to the skin. For a 9 to 11-pound turkey, allow 2 1/2 to 3-hours in total. But remember that ovens vary enormously, so just check by piercing the flesh between leg and body with a small sharp knife: when the juices run clear, the turkey is cooked. Just as it’s crucial to let the turkey come to room temperature before it goes in to the oven, so it’s important to let it stand out of the oven for a good 20 minutes before you actually carve it.